For the Thanksgiving break this year, my mom visited from Chicago. Having Thursday and Friday off from school, we decided to take my mom to the Sierra Nevada mountains because she never saw them before. A couple weeks in advance, I reserved an old fire tower in the mountains north of Lake Tahoe to spend Thanksgiving night in. The National Forest Service used to staff hundreds of fire towers which were built on the tops of mountains all throughout the West. The towers were staffed (some still are staffed) during the summer months, when lightening storms threatened the forests with wildfires. But in modern times, many places watch out for fires using airplanes instead, so the fire towers became obsolete. Now the Forest Service rents out some of the towers to the public at reasonable prices. You can reserve them online at recreation.gov or directly from the nearest ranger station, and most National Forest websites have a page about the towers they rent out, if there are any. 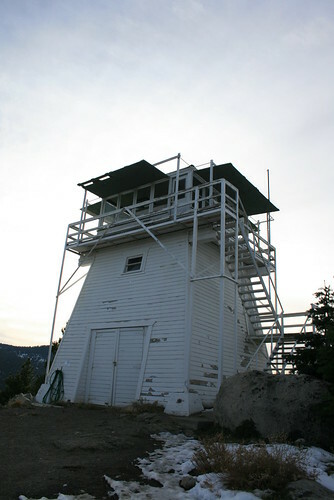 The Calpine fire lookout tower we spent Thanksgiving evening/night in. 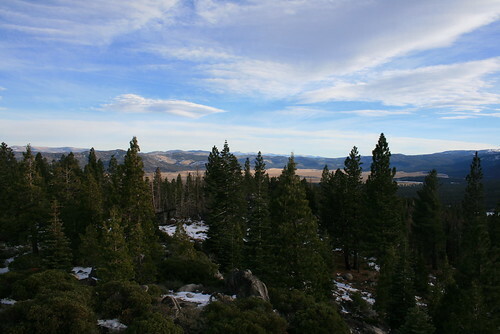 View of Sierra Valley from the Calpine fire lookout tower. 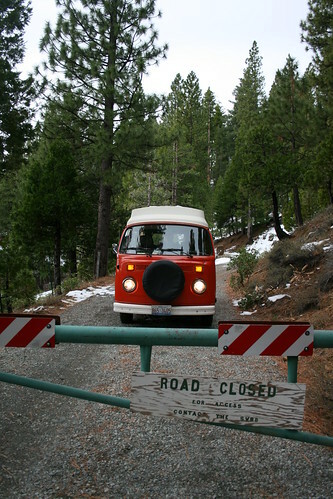 The road to the Calpine fire lookout tower was gated, so before heading there we had to stop at the Sierraville Ranger Station to pick up the gate lock combination and the lock combination for the tower itself. Since it was Thanksgiving day, they left us a small packet of info in a black mailbox outside the station. It gave us info and directions to the tower, which was just across the Sierra Valley. There was still snow on the ground from the snow storm they had a week before, but the road to the tower was still open. When we got to the road, it had compacted snow from where people drove before which had turned icy. The parts of the dirt road which were exposed to the sun were pretty muddy. 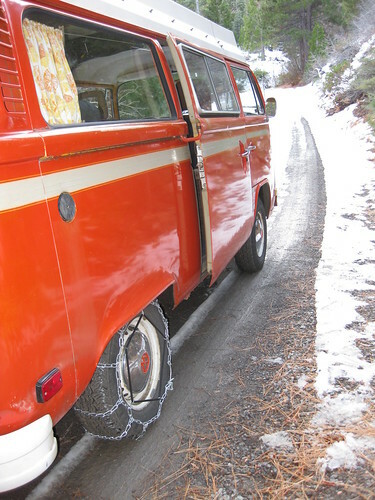 We decided it would be best to just put the chains on the tires so that we had more traction. It wasn't too hard to put the chains on, and it made driving much easier and safer. The chains are on the bus. Locked gate to the tower. 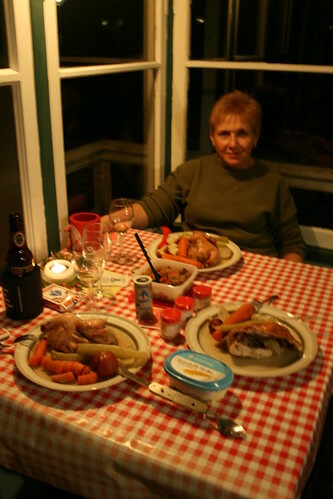 We brought everything with us that night to cook our own Thanksgiving dinner for three. Since a turkey would be too big, we got cornish hens, veggies & potatoes, cream of broccoli soup, and cake for dessert (although we ended up eating it for breakfast the next morning instead). The tower had a propane stove and oven, along with a propane heater, and sink, but no running water. We brought our own 7 gallon container filled with tap water up to the tower, which was plenty. As the sun began to set over the mountains, we put the food in the oven to bake while we had some soup and drinks. The tower had a deck of cards, and so many books to read. We relaxed, watching the sunset over the mountains, and just enjoyed the scenery. 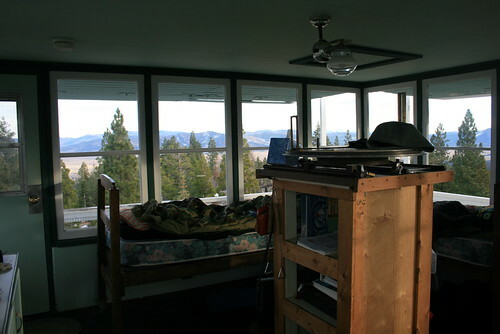 The beds in the fire tower. 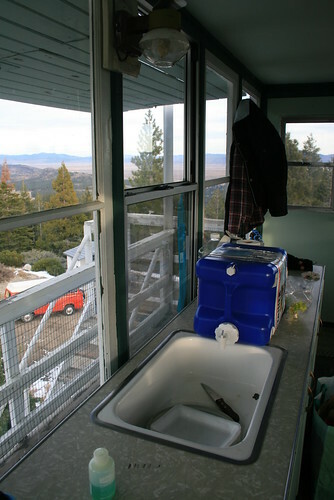 The sink in the fire tower (BYO water). 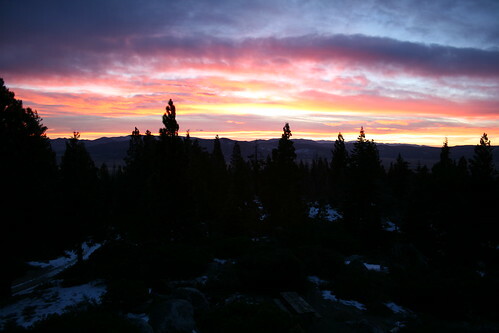 Evening at the Calpine fire lookout tower. 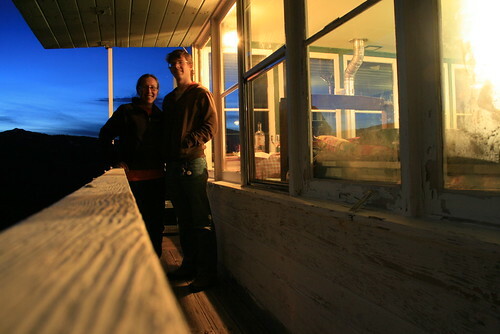 Night at the Calpine fire lookout tower. That night, when we went to bed, we could see the moon shining, which provided a bunch of light, but made it hard to see the stars. After the moon set, the stars were bright. Sometime after midnight, we were all awoken by a crazy wind, which ripped over the mountains and shook the wooden awnings over the windows. Sometimes the wind blew so hard, it felt like the whole tower was shaking! The wind came in gusts, which were becoming more and more frequent as dawn approached. Being surrounded by windows, when the sun came up it was hard not to wake up, with all the natural light beaming in. By that time, the wind was constantly blowing and it looked as if a snow storm was headed our way from the West. So we got our things packed and made coffee and had breakfast, and then started making our way out of the tower. Our next destination was Lake Tahoe, for a quick drive along its eastern shore, and then we were off on Hwy 395 south to show my mom some natural hot springs. 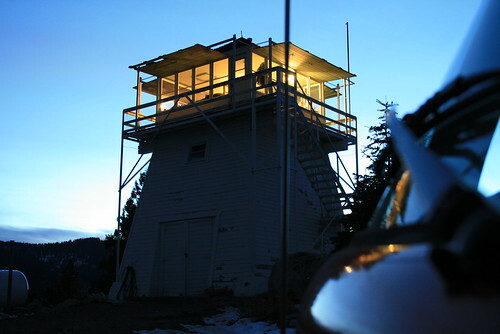 . .
Just became aware of the firelookout towers being for rent. Thanks for sharing your photos and experiences.